Pence told reporters that during the weekend he had two "candid" conversations with Xi, who is expected to meet President Donald Trump at a Group of 20 summit at the end of this month in Argentina. In Port Moresby, Papua New Guinea's capital, the impact of China's aid and loans is highly visible. But the U.S. and allies are countering with efforts to finance infrastructure in Papua New Guinea and other island states. 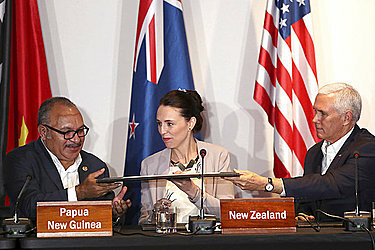 The U.S. has also said it will be involved in ally Australia's plan to develop a naval base with Papua New Guinea.